IBM has the longest history per se, and is also the most embedded in the IT industry. Many still perceive IBM as a computer hardware manufacturing company. However, by the mid-1990s IBM had already started a major corporate restructuring process, shifting its core focus from computer manufacturing to software services. In 2002 it acquired PwC Consulting to further its consultancy capabilities. But the seismic shift was finally completed in 2005 with the sale of its computer manufacturing line to the Chinese firm Lenovo. Cap Gemini was founded in 1967 [...] acquiring Ernsy and Young Consulting in 2002. [...] two distinct types of service. First, they provide software services across all tiers of the industry. Second, they provide business services, which essentially means management consultancy. IBM and EDS arguably have the great strengths in software services, while Cap Gemini and Accenture are more formidable in management consultancy. [...] To understand better the performance of students of Indian origin in the USA and the UK, it is necessary to consider other factors such as social class (Indians tend to be the most professionalised of all ethnic groups in both countries, with implications for educational attainment), family background (due to immigration policies, Indians in the West tend to come from scientific and technical backgrounds, influencing the subject preferences of their children) and perceptions of the job market (views of endemic racism in the labour market, particularly in the UK, has meant Indians have tended to expend more effort in education generally, and in subjects with greater employability, such as mathematics in particular). Indirect control was enforced by a variety of levers which would be applied should the Indian government ever stray out of line. The most important of these levers was access to food. At independence, India was barely able to feed itself. Maintaining access to food imports was thus a high priority for the Indian government, particularly in times of drought. A bad monsoon would, therefore, necessitate a massive importation of food which, given India's financial constraints, could only be met on concessional terms. Invariably, the only country able to offer concessions on such a scale was the USA, leading to Indian dependency on US largesse. This situation famously ensured India's compliance with the US operations in Vietnam. More importantly, it meant that India would not be able to follow policies which went against US interests until it achieved food self-sufficiency. While Pakistan was primarily established as a base and bastion for the projection of Anglo-American power into the Middle East and South-East Asia, its proximity to India also served to inhibit the Indian government from pursuing policies which might be deemed negative in London and Washington. [...] Of the various TNCs operating in India, IBM was singled out [...] 'abuse' of a bureaucratic loophole had allowed it to exert a stranglehold on the market while importing outdated, second-hand and overpriced computers for resale in India. Morever, its operations were seen as leading to a net export of foreign exchange. Dilution of the IBM subsidiary as a means of obtaining control over its activities was therefore most apposite. Control would not only curb many of IBM's economically damaging activities, it would also facilitate the country's computerisation as well as support a more favourable balance of payments. In the end, IBM refused to dilute its stake in its subsidiary [...] IBM made a number of alternative offers - including a high export commitment from domestic production. These offers were all turned down by the Indian government. IBM - at the time the largest corporation in the world - was forced to close down its Indian operations in 1977. 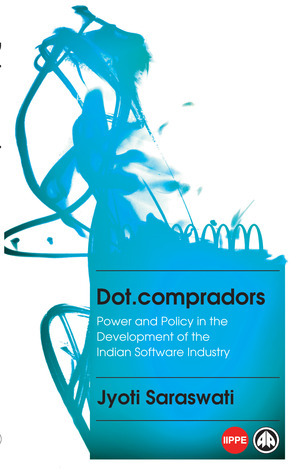 This impacted directly, rapidly and negatively on the competitive structure of the Indian hardware industry. The outcome was a heavily fragmented industry comprising numerous small computer firms. Lumbered with limited market share, excessive price competition and uneconomic scale, most firms were unable to generate the profits required for reinvestment in upgrading and expansion. [...] Reinvesting profits with a longer-term view of breaking into export markets made little sense in the absence of government commitment towards developing the industry. The competition in the domestic labour market between Giants and Majors initially induced the Indian Majors to move up the value chain. [...] the Majors had long since settled on informal anti-poaching agreements amongst themselves, acknowledging that the costs of poaching far outweighed the gains. Second, the Giants, who could in theory, reap all the benefits of poaching while facing none of the costs (given their superior ability to attract and retain talent), also refrained from such practices during this period. They were just beginning to enter India, had not yet secured NASSCOM, and did not want to trigger any antipathy to their expanding presence. reminds me of the no-poaching agreements in SV, and also in Germany. what should the left take on this be?? ?